Tackling a home renovation isn’t easy, especially with all the decisions you need to make in a short amount of time. What kitchen countertops do you want, which light fixtures do you want in the living room, what floors do you want installed throughout? It’s a never-ending sea of questions. But to help make your job a bit easier, we’re going to tell you why you should choose to install luxury vinyl floors throughout your home. Advancements in technology have allowed the printed images on vinyl floors to mimic the real material to such a degree that it's barely noticeable. 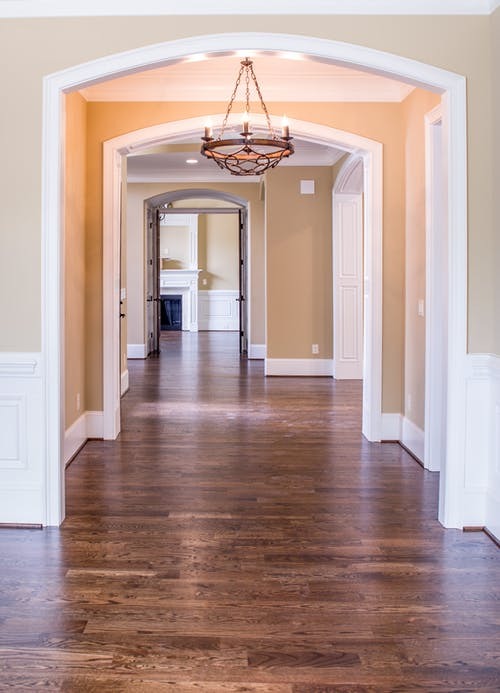 The appearance of vinyl flooring has improved dramatically over the years, making it harder to distinguish between it and natural wood or tile floors. Luxury vinyl planks and tiles are available in an array of patterns that can imitate almost any hardwood or stone you want. Making sure your floors can hold up against a house full of kids or energetic pets is important with such an investment. When you choose luxury vinyl floors, you don’t have to worry about chipping or scratches. Vinyl is also resistant to water, so you don’t have to panic about potential water damage, and stains. Have your luxury vinyl planks installed in high traffic areas and don’t give it a second thought. Taking luxury vinyl flooring out of the dark shadow that is tradition vinyl sheeting, many floors today are designed to imitate natural materials like stone or wood. There are even some vinyl tiles that are composed of 75% limestone and 25% vinyl material. So much work has gone into making luxury vinyl floors appear more authentic than ever before that some tiles even require grout to help them in place. Natural products are used in the constriction and printing of luxury vinyl flooring. Not only that, but the actual tiles and planks are shaped to replicate the product their imitating. Whether you want an imitation stone tile or solid light wood plank, it can be done and no one will be the wiser. As the majority of luxury vinyl flooring comes in the form of a plank or tile, you won’t have to worry about dealing with traditional vinyl sheeting that’s sold in room-sized dimensions. Vinyl has always been a cost-efficient option when shopping around for new flooring materials. The upgrade from regular vinyl flooring to luxury vinyl still makes it a desirable choice for homeowners, builders and interior designers on a budget. Luxury vinyl flooring isn’t the same as it once was. You can say with confidence that your floors are made of high-quality vinyl material and guests are sure to be shocked. At Touchtone Canada, we provide our customers with high-quality residential and commercial flooring. Our Edmonton facility that spans 50,000 square feet houses a wide variety of flooring options for any home renovation, including carpet, hardwood, luxury vinyl, laminate and more. Whether you’re a homeowner or interior designer, our Edmonton store it suitable for all kinds of renovations. With over 25 years of excellent customer service, be sure to visit our website and start planning your home renovation today!